1 Process red peppers, basil and 1 clove garlic until smooth in food processor or blender; set aside. 2 Heat oil in large skillet over medium-high heat and cook remaining garlic clove, finely chopped and shrimp, stirring constantly, until shrimp turn pink; remove and set aside. 3 Stir water and milk into same skillet and bring to the boiling point. Stir in Knorr® Italian Sides™ - Alfredo. Reduce heat to low and simmer, stirring occasionally, 8 minutes or until noodles are tender. Stir in red pepper puree and pepper; heat through. 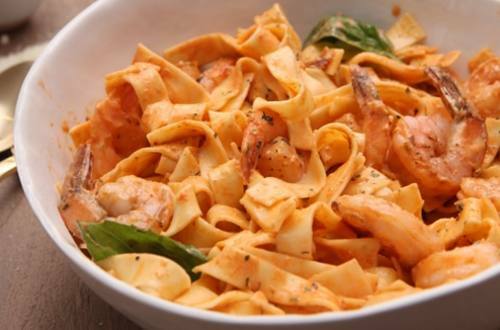 To serve, arrange shrimp over noodles and.garnish, if desired, with fresh basil.